Sign up for your uClassify account on this page. Once you’ve signed up you will see your allowance – the free account will be sufficient for most uses. Then navigate to their API Keys page and copy the ‘Read’ API key, which you need to paste into URL Profiler. 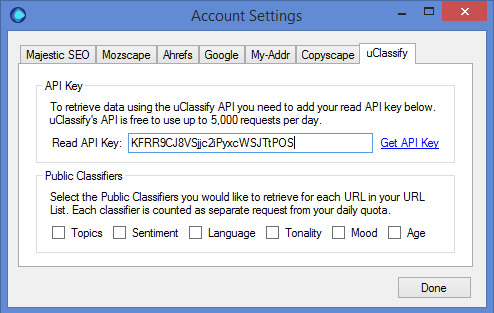 Click ‘Accounts’ in the top navigation and then choose the ‘uClassify’ tab, then paste your API Key into the box. You will also need to select the public classifiers you would like to retrieve for each URL in your list. Each classifier is counted as a separate request from your daily quota.